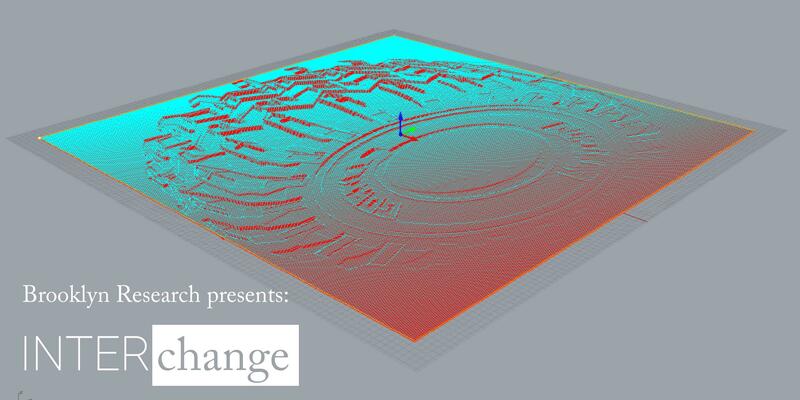 Join us June 6th for Michael DeLucia’s talk in the INTERchange series at Brooklyn Research. Delucia’s work resides at the liminal edge between physical and virtual space. His process involves intersecting 3D modeled worlds with physical media via CNC milling and other computer controlled processes. DeLucia lives and works in Brooklyn, NY. He studied at Royal College of Art, London (MA) and Rhode Island School of Design (BFA). DeLucia had his first solo museum exhibition at The Museum of Contemporary Art, Santa Barbara (MCASB) in 2015. Other solo exhibitions include 11R, New York, NY; Galerie Nathalie Obadia, Brussels and Anthony Meier Fine Arts, San Francisco. DeLucia has been included in group exhibitions at the Museum of Contemporary, Detroit, MI; Lyles & King, NY; Bureau, NY; Halsey McKay, East Hampton, NY; Derek Eller Gallery, NY; Socrates Sculpture Park, LIC; Andrea Rosen Gallery, NY; and Sculpture Center, LIC. His work has been featured in reviews in The New York Times, Artforum, Modern Painters, and The Wall Street Journal, among others.